In 2008, the U.S. Army Corps of Engineers (USACE) began implementing the Caspian tern management actions outlined in the January 2005 Final Environmental Impact Statement (FEIS) and November 2006 Records of Decision (RODs) for Caspian Tern Management to Reduce Predation of Juvenile Salmonids in the Columbia River Estuary. This management plan, which was developed jointly by the USACE, the U.S. Fish and Wildlife Service, and NOAA Fisheries, seeks to redistribute a portion of the Caspian tern colony on East Sand Island in the Columbia River estuary to alternative colony sites in interior Oregon and the San Francisco Bay area by 2015. The goal of the plan is to reduce Caspian tern predation on out-migrating juvenile salmonids (salmon and steelhead) in the Columbia River estuary, and thereby enhance recovery of salmonid stocks from throughout the Columbia River basin. Thirteen of 20 evolutionarily significant units (ESUs) of Columbia Basin salmonids are currently listed as either threatened or endangered under the U.S. Endangered Species Act (ESA). The Caspian Tern Management Plan calls for the creation of approximately 7-8 acres of new or restored Caspian tern nesting habitat in interior Oregon (specifically Fern Ridge Lake, Crump Lake, and Summer Lake) and the San Francisco Bay area (specifically Don Edwards National Wildlife Refuge, Hayward Regional Shoreline, and Brooks Island) and to actively attract Caspian terns to nest at these sites. As alternative tern nesting habitat is created or restored, the available tern nesting habitat on East Sand Island will be reduced from its current size (approximately 5 acres) to 1 – 1.5 acres. Creation of tern nesting habitat at alternative colony sites and the reduction of nesting habitat at East Sand Island will be accomplished in phases at a ratio of two new acres of habitat provided for each acre of habitat reduction on East Sand Island. Once fully implemented, the management plan is expected to reduce the East Sand Island Caspian tern colony from its current size (approximately 10,700 nesting pairs in 2008) to about 3,125 – 4,375 nesting pairs, or a reduction in colony size of 60-70%. A reduction in the size of the East Sand Island Caspian tern colony to 3,125 – 4,375 pairs is estimated by NOAA Fisheries to increase the annual population growth rate of three ESA-listed ESUs of Columbia Basin steelhead by 1% or greater. Steelhead were the focus of NOAA Fisheries’ analysis because previous studies have revealed that tern predation rates on juvenile steelhead exceed those of other salmonid species in the Columbia Basin. The reduction in the size of the Caspian tern colony at East Sand Island is expected to reduce annual consumption of juvenile salmonids (smolts) from the Columbia River basin by 2.5 – 3.0 million fish. Annual consumption of juvenile salmonids by Caspian terns for the period 2001-2007 has average approximately 5 million juveniles. The potential for further reduction in Caspian tern nesting habitat at East Sand Island to 1 acre is addressed in the RODs. Before nesting habitat on East Sand Island can be reduced below 1.5 acres, additional alternative sites for tern nesting would need to be developed. (The criteria for selection of alternative sites are described in Appendix G of the FEIS.) If potential new colony sites that have not already been analyzed in the FEIS are identified, an environmental assessment would be prepared for each site. A reduction to 2,500 -3,125 pairs could be accomplished with development of alternative tern nesting habitat at two potential additional sites in northeastern California, Tule Lake National Wildlife Refuge and Lower Klamath National Wildlife Refuge, which are undergoing environmental assessments. The USACE completed construction of a 1-acre island specifically designed for Caspian tern nesting at Fern Ridge Lake near Eugene, Oregon in February 2008. Restoration of a 1-acre Caspian tern nesting island on Crump Lake in the Warner Valley northeast of Lakeview, Oregon was completed in March 2008. The restored island in Crump Lake was at the location of a former island that supported colonial-nesting waterbirds prior to its destruction by human and natural causes. Following island construction and before the arrival of terns from their wintering grounds, Caspian tern decoys and audio playback systems that broadcast tern calls were deployed on both islands to attract terns to nest. There has been no prior history of Caspian tern nesting at Fern Ridge Lake or elsewhere in the Willamette Valley, so we suspected that Caspian terns might not nest on the Fern Ridge Lake tern island during the first breeding season following construction. Consequently, video cameras were used to monitor the island instead of direct observation by a field crew, and the island was visited periodically throughout the breeding season by project staff. Review of video footage revealed that Caspian terns visited the island after the breeding season, presumably once post-breeding terns dispersed from their nesting colonies. During the month of August the Fern Ridge Lake tern island was visited by Caspian terns on 23 different days, with as many as 9 terns observed on the island at one time. We will attempt to attract Caspian terns to nest at Fern Ridge Lake again in 2009, and we are hopeful that some terns will attempt to breed on this new island in years to come. There is a history of Caspian terns attempting to nest at Crump Lake in the Warner Valley of southcentral Oregon. Although we expected that some Caspian terns might attempt to nest on the new Crump Lake tern island during the first breeding season, we were not prepared for what occurred. During May, a Caspian tern breeding colony formed on the Crump Lake island and grew to about 150 breeding pairs. Concurrently, about 500 pairs of California gulls, 850 pairs of ring-billed gulls, and 10 pairs of double-crested cormorants initiated nesting on the new island. In early June the Caspian tern colony dropped to a low of 23 nesting pairs due to nest predation by gulls that were nesting nearby. We began to selectively remove gulls that were observed to depredate tern eggs, once the required depredation permits had been issued. In total, 10 gulls were lethally removed from the tern colony during the month of June. Subsequently, the Caspian tern colony expanded to 428 breeding pairs, which ultimately raised about 145 young terns to fledging age. Hundreds of pairs of nesting California and ring-billed gulls and one pair of cormorants also successfully raised young on the Crump Lake island. Thirty of the Caspian terns that colonized the newly constructed island in Crump Lake had been previously banded. Of these, 18 had been banded at the Crescent Island Caspian tern colony on the mid-Columbia River near Tri-Cities, Washington, about 450 km to the north. Five of the banded terns on Crump Lake island had been banded on East Sand Island in the Columbia River estuary, over 500 km to the northwest. These band re-sightings demonstrate that Caspian terns can be recruited to new colony sites from existing breeding colonies over considerable distances. The USACE, in partnership with the Oregon Department of Fish and Wildlife, created about 1 acre of nesting habitat for Caspian terns at Summer Lake Wildlife Area near Paisley, Oregon prior to the 2009 nesting season. Construction of two 0.5-acre islands at the Summer Lake Wildlife Area in south-central Oregon was initiated in December 2008 and completed by early March 2009. Caspian terns have intermittently nested in small numbers on the Summer Lake Wildlife Area during the last two decades, but suitable nesting habitat is very limited. A half-acre island was constructed in East Link Management Unit, the site of the most recent tern nesting activity on the Summer Lake Wildlife Area (5 nesting pairs in 2003 and 3 pairs in 2005). A second half-acre island has been built on Dutchy Lake; this island consists of a floating platform instead of a fill island because Dutchy Lake is a permanent body of water. Prior to the 2010 nesting season, an additional half-acre island will be constructed in the Gold Dike Management Unit in Summer Lake Wildlife Area. This island will provide alternative nesting habitat for terns nesting on the island in East Link Management Unit in years when the impoundment is drained for management purposes. The USACE prepared nesting habitat for Caspian terns at East Sand Island in late March, as in previous years. Without annual restoration of the bare sand nesting habitat that Caspian terns prefer, the East Sand Island colony would be eliminated within a year or two by rapidly encroaching pioneer vegetation. In 2008 and 2009, the USACE prepared 5 and 3.5 acres of tern nesting habitat on East Sand Island, resepectively, instead of 6 acres as stipulated in the Final Environmental Impact Statement (USFWS 2005: Chapt. 2, section 2.3.3). The USACE also precluded Caspian terns from nesting on other dredged material disposal sites in the Columbia River estuary (e.g., Rice Island, Miller Sands Spit, and Pillar Rock Sands) in 2008, and plans to continue to do so in the future as the available tern nesting habitat on East Sand Island is gradually reduced. The USACE plans to build about 3 acres of Caspian tern nesting habitat in southern San Francisco Bay prior to the 2010 nesting season. In partnership with the U.S. 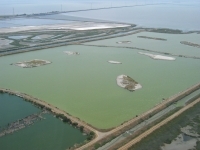 Fish and Wildlife Service, the USACE is planning to build two 1-acre floating islands on working salt ponds within Don Edwards National Wildlife Refuge. In partnership with East Bay Regional Parks, the USACE plans to enhance the habitat on two existing islands in former salt ponds at Hayward Regional Shoreline to create about 1 acre of suitable nesting habitat for Caspian terns. Restoration of Caspian tern nesting habitat at Brooks Island in central San Francisco Bay is pending further study of the potential impact of an expanded Brooks Island Caspian tern colony on survival of juvenile salmonids from the Sacramento River basin, some stocks of which are listed under the Endangered Species Act. Potential additional alternative habitat sites were identified in 2008 in northeastern California that would increase the acreage of Caspian tern nesting habitat outside the Columbia River basin. 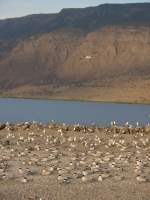 Environmental documentation to address the potential for tern habitat development at Tule Lake and Lower Klamath National Wildlife Refuges (NWRs) in northeastern California are in preparation for public review and comment. The potential exists for the construction of three islands totaling four acres at these two NWRs in an area historically used by Caspian terns for nesting. 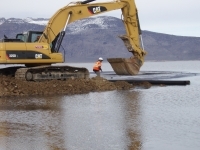 At Tule Lake, the USACE is tentatively planning to build a 2-acre tern island prior to the 2010 nesting season, in partnership with the U.S. Fish and Wildlife Service. The Corps and the Fish and Wildlife Service are tentatively planning to build a 1-acre tern island in the Orems Unit of Lower Klamath NWR prior to the 2010 nesting season.. Finally, before the 2012 nesting season, the Corps and the Fish and Wildlife Service are planning to build a second 1-acre island on Sheepy Lake in Lower Klamath NWR. The Sheepy Lake island would serve as an alternative breeding site for Caspian terns when the Orems Unit is drained for managment purposes. Once island construction is completed at each of the above alternative colony sites, social attraction consisting of Caspian tern decoys and audio playback systems will be used to help establish and maintain a tern breeding colony. All colony sites will be monitored on nearly a daily basis to determine colony size, nesting habitat use, diet composition, nesting success, and factors limiting colony size and nesting success. If nest predation by gulls becomes prevalent enough to threaten an incipient tern colony at any of these sites, then limited gull control may be conducted under depredation permits to enhance the chances of establishing Caspian tern colonies. Once all the alternative Caspian tern colony sites have been built, tern nesting habitat at East Sand Island will be reduced to 1.5 to 2.0 acres, as described above. If the amount of new alternative nesting habitat provided for Caspian terns exceeds the 7 acres stipulated in the Records of Decision, then the acreage of tern nesting habitat on East Sand Island may be reduced to 1 – 1.5 acres, with the objective of providing nesting habitat for approximately 2,500 to 3,125 pairs of Caspian terns at the mouth of the Columbia River. The main driver behind the plan to relocate a majority of the Caspian tern colony that currently nests on East Sand Island in the Columbia River estuary is to increase the survival of juvenile salmonids from throughout the Columbia River basin. There are, however, significant benefits to the Pacific Coast population of Caspian terns that may be realized by implementation of the Caspian Tern Management Plan. Currently, approximately two-thirds of all Caspian terns belonging to the Pacific Coast population nest on East Sand Island. Consequently, the tern population is more vulnerable to local catastrophes (for example, storms, disease outbreaks, oil spills, predation events, human disturbance) than it would be if it were distributed over a broader geographic area and a larger number of nesting sites. Redistributing the existing breeding population of Caspian terns to a number of smaller colonies over a larger geographic area will reduce risks to both terns and Columbia Basin salmonids. Close monitoring of this plan throughout its implementation is necessary to determine whether the intended benefits to both salmonids and terns are realized and, if not, what adaptive modifications to management actions may be warranted to achieve desired results.